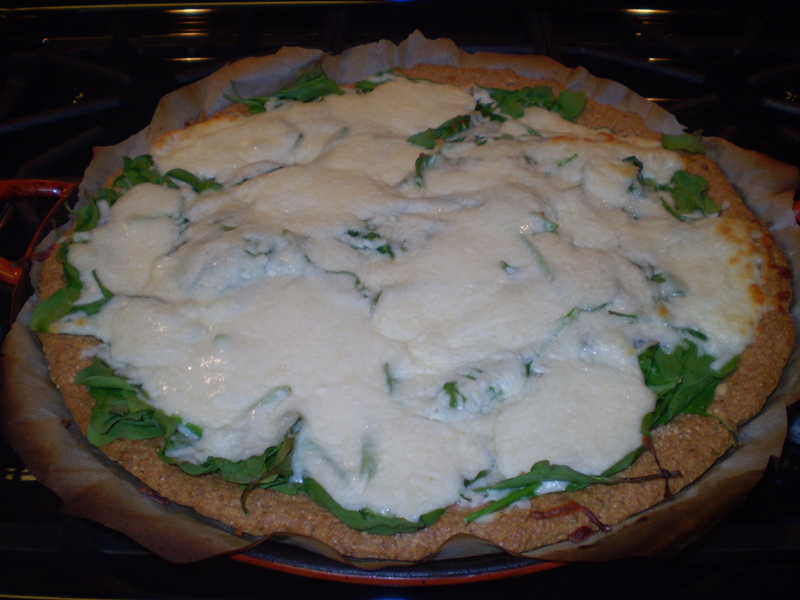 I have decided this is my favorite pizza crust for my Diabetic, Low-Carb, real Food diet. It is SOOO delectable that my hubby (non-low-carb) enjoys it as much as I do and I have to fight him for it. The crust is supple yet sturdy (holds up to toppings and cheese). The flavor is nutty but not overpowering. 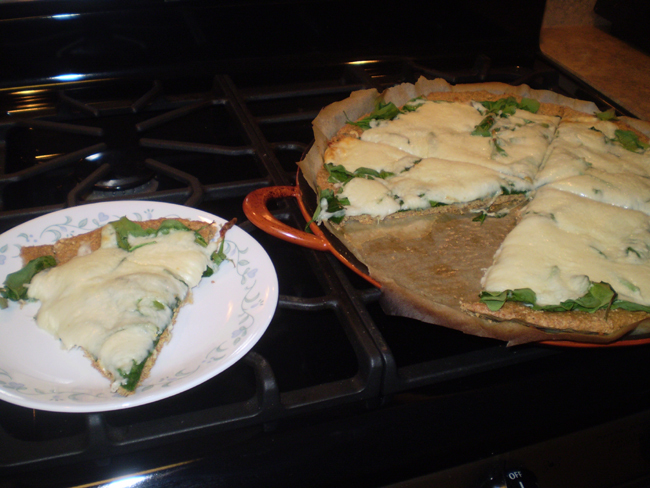 A perfect taste for me and a far cry from the bland pizza crusts I grew up on. Fight for taste! ~Grind flax seed into fine meal. Add dry ingredients and mix well. ~Mix wet ingredients and whisk together to blend completely. Add wet ingredients to dry and whisk together until smooth. 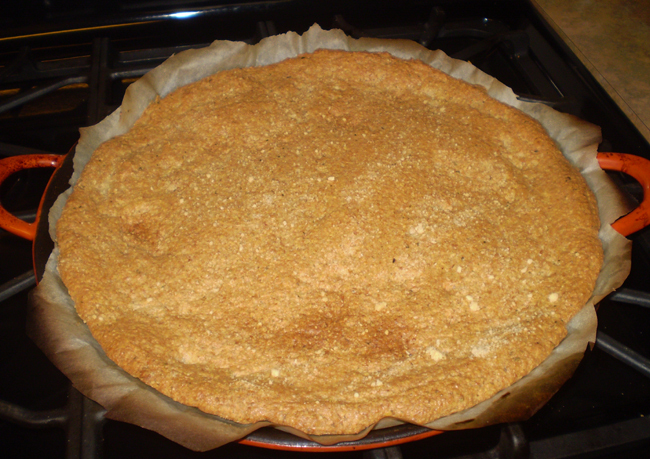 ~Let sit about 5 minutes to thicken, but do not let sit longer as mixture will thicken too much to spread easily. ~Oil a 15-inch pizza pan with olive oil / lecithin or place parchment paper over pan and lightly oil the parchment. ~Bake for about 15-18 minutes or until light golden brown. 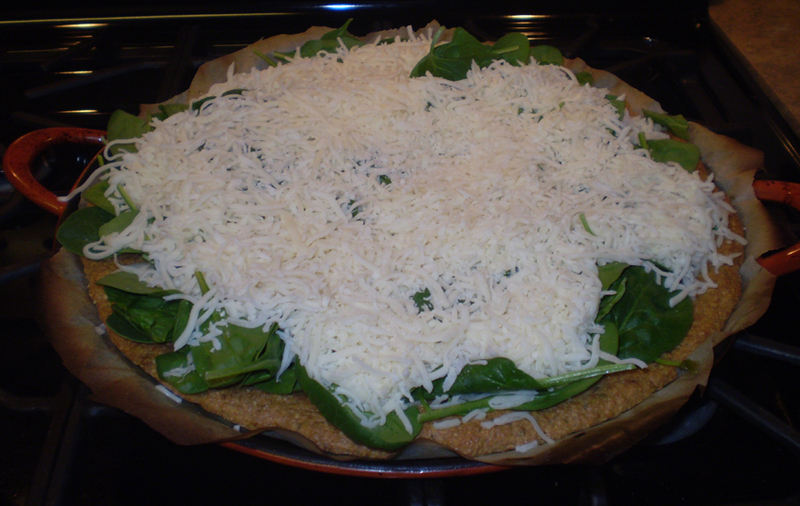 ~Top and bake 8-10 minutes or until cheese is melted. I like to top mine with some Ranch dressing, roasted green beans and garlic, organic roasted chicken and organic mozzarella. Per Serving (Crust only): 107 Calories; 7g Fat (58.3% calories from fat); 6g Protein; 6g Carbohydrate; 4g Dietary Fiber; 80mg Cholesterol; 444mg Sodium. Exchanges: 1/2 Grain(Starch); 1/2 Lean Meat; 0 Vegetable; 1 Fat; 0 Other Carbohydrates. Per Serving (crust only): 105 Calories; 7g Fat (57.2% calories from fat); 5g Protein; 7g Carbohydrate; 6g Dietary Fiber; 1mg Cholesterol; 479mg Sodium. Exchanges: 1/2 Grain(Starch); 1/2 Lean Meat; 1 Fat; 0 Other Carbohydrates. NOTES : Sprinkle with Parm cheese before baking. Bake 15-18 minutes for large crust and 10 minutes for mini crusts.